Regupol slip-resistant equestrian floor surfaces ensure a safe, quiet environment with excellent thermal insulation. The excellent cushioning properties mean Regupol surfaces are kind to hooves, joints and tendons. Regupol products have been utilised in equestrian settings for over 25 years, in the form of tiles, pavers, sheets and matting. Our products offer an economical way to maintain a clean environment where horses feel at ease. Regupol equestrian products are frost resistant, water permeable, won’t rot and require less straw. Our surfaces are easy to install and maintain with no sealing or final layer required. The permanent elasticity of Regupol products means longevity of performance. The acoustic insulating properties ensure a quiet and tranquil environment. Injuries, inflammations and stress issues are reduced. The hooves of unshod horses will not suffer or exhibit any signs of wear. Ideal for stables, wash bays, horse floats, breezeways, parade circles & other applications. Read on….! Reliable, uniform falling protection, non-slip properties. Your safety too – super anti-slip in wet and dry conditions. Healthy choices – horses thrive in a dust free and safe environment. Looks great – special square tile pattern looks great on walls. Hygienic, low-maintenance, easy to clean. Permeable to water, quick to dry. Varied design and application possibilities. Quick to install, quick to remove again. PUR-bonded rubber fibres or granules, solid-coloured. Can be installed in different patterns such as traditional running bonds or 45 degree stacks. Available in two colours: terracotta & black which can be combined to create borders or checkerboard patterns. Single-layer construction consisting of compacted, heavy-duty material. Drainage & cable grooves on underside. Dummy joint on top at 500mm. Loosely laid onto a compacted, permeable gravel bed (edging elements are required) or loosely laid onto concrete/asphalt (edging and incline required) or glued onto the wall or nailed/screwed into wall studs or wooden slats. Regupol Interlocking Pavers deliver high impact and high performance in all equine applications. The original, and still the best, Regupol Interlocking pavers have been installed in equine facilities across Australia for over 25 years. Regupol Interlocking Pavers deliver super anti-slip in wet and dry conditions. Healthy horses thrive in a dust free and safe environment. This product is the ultimate shock absorbent surface for horses! The terracotta cobblestone enhances any area and is extremely quiet under foot. Healthy – horses thrive in a dust free and safe environment. Safe – delivers super anti-slip in wet and dry conditions. Comfortable – the ultimate shock absorbent surface for horses. Stress free – horses remain calm on thick, cushiony surface. Looks great – the terracotta cobblestone enhances any area. Sounds great – extremely quiet under foot – reduces impact sound. Extremely resilient & durable, even under tough conditions. 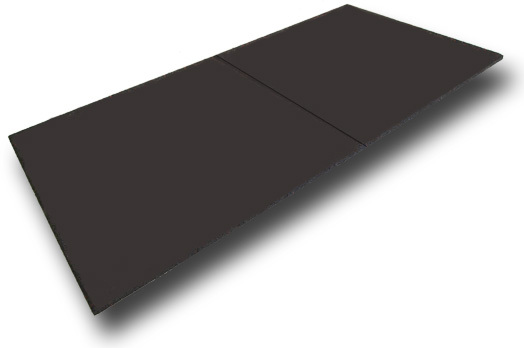 Manufactured from recycled rubber, making it a sustainable way to provide safe surfaces. Available in two thicknesses: 21mm & 43mm. Available in two colours: terracotta & black. Interlocking Pavers (43mm): As with common concrete interlocking pavers, the sub-base should be frost-free and consist of a fine gravel layer on top. Alternatively, they can be laid loosely onto concrete/asphalt. Edging elements are required. Interlocking pavers (21mm): Fully bonded to concrete/asphalt. Stable Mats offer so many benefits to horses and their owners because they can be used in wash bays and stables without gluing them down. In fact they can be used anywhere you want to offer your horse guaranteed comfort and a healthy environment. Safe – delivers all the safety aspects of Regupol® pavers and more. Healthy alternative – can reduce bedding by up to 70%. Hygienic – permeable to water and urine with good drainage. Durable – the ultimate shock absorbent surface for horses. Clean – easy to muck out stables and hose out fresh on a daily basis. Keeping things quiet – horses can rest easily on Regupol®. Cost effective – huge reduction in bedding expenses long term. Do it yourself – easy to install, no adhesion required. Available in terracotta or black. Horseline Aussie Gold rubber matting is designed as a resilient and safe floorcovering for horses within wash bay areas, horse floats, breeze ways, stable floors etc. The continuous rolls offer quick and easy installation backed by exceptional slip resistance. Safe – high strength and high slip resistance in wet and dry conditions. Anti-fatigue – kind to hooves and joints when travelling. Clean and comfortable – an easy product to clean. Keeping things quiet – horses remain calm. Proven – to keep you and your horse safe and confident underfoot. Do it yourself – complete installation kits are available. Regupol Veterinary Hospital Floors are custom tailored, totally seamless ‘floor and wall’ systems – recommended for veterinary hospitals and recovery floors. Our unique ‘floor and wall’ system is designed for ultimate comfort for the animal while helping to provide a completely bacteria free and easily maintained environment. The special system ensures equal thickness, density and shock absorbency. Hygienic – the floor and walls junctions are totally sealed. Safe – during post-surgery, safety is the number one priority. Reassuring – offering comfort in recovery, custom tailored to suit any horse or animal. Proven – Regupol Veterinary Flooring has been used in Australia for over 10 years. Regupol equestrian surfaces have been used across Australia for 25+ years! Extremely hard wearing with a long service life. Suitable for internal & external areas. Injuries, inflammations, stress & overload are reduced. Impervious to moisture, sunlight, heat & frost. Quick drying after rain. Helps to maintain safety by creating a soft, permanently elastic & skid-proof surface. Made from sustainable materials and able to be recycled at the end of its service life. Acoustic & thermal insulating properties ensure a quiet & tranquil environment. The tiles & pavers are quick and easy to install & remove by novice or professional. No sealing or final layer required. The elasticity of Regupol tiles & pavers provides a pleasant walking sensation, similar to the feeling of walking on grass.